runDisney continues the renaming of their races with the latest being the Star Wars Half Marathon in Disneyland. Thanks to avid runner BazTastic77, we get a peek at the newly renamed Resistance Run as it appears in Active.com accounts. While that isn’t an official renaming on a Disney site, Active.com is the portal that runDisney participants use to officially register for all races. 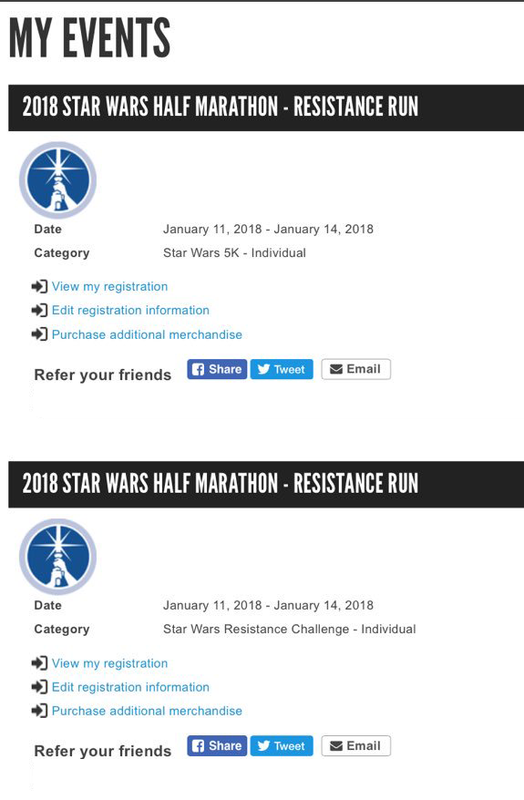 The Resistance Run was formerly named Star Wars Half Marathon – The Light Side. Unlike the renames that occurred earlier this year, this rename seems to be a narrowing of the name instead of a generic name. As a result of this renaming, we assume the Walt Disney World sister event, Star Wars Half Marathon – The Dark Side will receive a new name as well, but that remains to be seen.